My eyes have long ago reached the point where I can no longer use iron/open sights. Consequently, I have fitted scopes to all of my rifles. I am having no end of problems betting a suitable and effective side mount for my 30.30 Model 94 top eject manufactured in 1974. I have looked at a number of options that I have been able to find online...Weaver two piece, Kwik Sight and Williams, with the Williams looking like it is the pick of the bunch. Anybody had any experience with offset mounts and if so, what are your suggestions? The next problem is trying to find one here in Australia. I considered a scout mount, but a decent scout scope is beyond my means at the moment. I'm open to any and all suggestions 'cause I want to get my thutty thutty back onto the firing line. www.mod94scoperail.com/index.html I assume mounts are exportable from the U.S. as they quote international shipping rates. I sold a model 94 because I wanted a rifle I could easily scope. Today I would have kept it and used a reflex or red dot sight. They are accurate enough for hunting at 30-30 ranges. Back then the only option was the long eye relief scope. Thanks for this Mac...I saw this sight rail online, but it would require a red dot, hologram or scout scope. I have a Tasco PDP4 red dot, but at 100 metres the dot blots out too much of the target. I would prefer the side mount because I already have a scope I can fit and a scope mounted at the receiver shouldn't upset the balance of the rifle. I might have to "bite the bullet" and give Williams Gun Sight a phone call (they don't show an email address as far as I can see) and get availability, price and whether or not they will post to Australia. Williams makes high quality products in my experience. Also, try these guys for a scout type mount. They are in Fort Worth, TX. Vince, I use a 2.5x Leupold Scout Scope on my lever action and love it. I first saw a scout scope set-up on an old-timer's Winchester 30-30. It was natural to shoot 2-eyes open. I was interviewing the "old timer" regarding his experience as a radio operator flying B-29s in WWII. He flew in Operation Matterhorn which went from India, across the Himalayas, refueled in China, then went on to Japan. Hey Vinnie check this e-bay address. I just noticed there's quite a few Williams sights, don't know if they have what you want but it might be easier for contacting them. Thanks Suz...I'll keep an eye on this guy's EBay sales and maybe he will come up with something suitable. If you change your mind I have seen this mount on a 94 or at least it looked like this mount. It was at the gun show I attended in Las Vegas a few years back. It had no scope but the dealer selling it suggested a reflex sight. The mount appeared solid and well made. The rifle was pre-64 and in very good condition. The price was right. Unfortunately it is way too expensive for an individual to export firearms to Canada from the U.S. 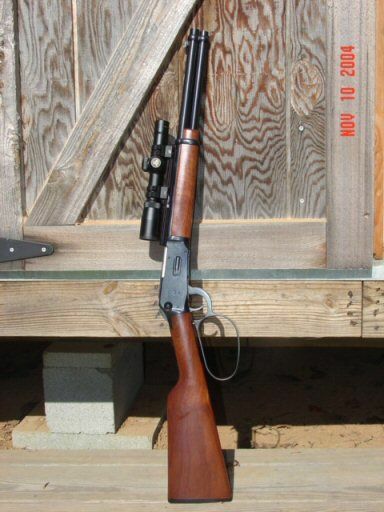 I eventually found my Savage 99 so I have my lever action but I sure liked that 94. Good luck mate. We used the Weaver side mounts on Browning Shotguns before factory bases were available !!! Never had an issue shooting 1 and 1 1/4 ounce slugs.....a little on the ugly side but they worked. Vince, here's an XS "Scout scope" mount on a Win 94. The scope is a Nikon but I'm not sure if they make it any more. Midway lists eight "Scout scopes" from $125 on up. A handgun scope might work, depending on its eye relief. Thanks for the heads-up on XSSights Slim and Punkin. I actually have an XSSight rail for the Mod 94 and had a Tasco PDP4 Red Dot on it, but the sight was a bit bulky (made for a pistol and for shooting Bianchi Cup) and the dot was too big (covered too much of the target at 100 metres. I am looking at the price of long eye relief scopes out here in Aussie, but so far the ones I have found are beyond my meagre means...gonna have to save a bit. I already have a 4x Tasco Pronghorn scope so if the cost of a side mount works out cheaper it will be a better option for my budget. I'll just keep searching and see what comes up. what about a red dot mate???? cheap as chips now and only need a single base which you could put forward of action??? they are around $70 over here so even with a gunsmiths help...maybe doable??? I think all handgun scopes I've had (Thompson/Center, Leupold, Nikon and Bushnell) would work. I found several handgun scopes that required more eye relief than was available with my scout scope mount. Yeah, most handgun scopes start at about 14" minimum. You might check out Bushnell's long eye-relief scope - www.midwayusa.com/prod...cle-matte. Won't break the bank and might give you enough clearance at 6"...plus it is currently on sale. Vince, why not a peepsight? I did that on my old Winchester 94. I'll send you a picture.